The Corporation’s administration awarded HEDNO’s employees’ children who were excellent students within the school year 2013-2014 within the framework of Corporate Social Responsibility. 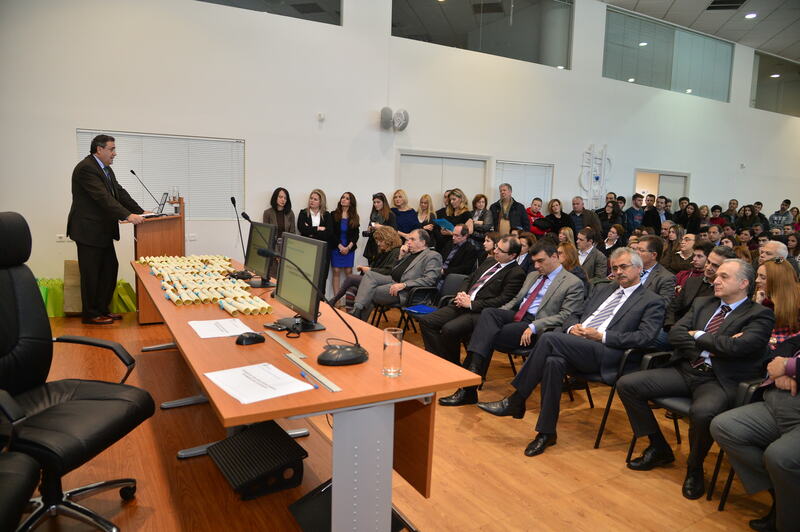 In the special event organized by the Human Resources Department on Wednesday 28.1.2015, 75 children of HEDNO’s employees were awarded in total within the Attica Region (3 graduates of Universities and Technological educational institutes, 26 school graduates (“Apolytyrion” from Lyceum and 46 graduates of secondary school-“Gymnasio”). Also, gifts were offered to excellent students (tablet and laptop) to reward their efforts. The event has begun with the opening speech of Mrs. Athina Manousaki, Director of Human Resources Department, while salutations were addressed by Mr. Konstantinos Zontanos, Corporation’s Chairman & CEO and Mr. Michael Broustis General Manager for Support Operations who gave the awards and the gifts to the children. As underlined by the Corporation’s Chairman & CEO, Mr. Zontanos: “HEDNO’s Corporate Social Responsibility is applied firstly within the Corporation. HEDNO considers as its duty to support the education and to reward children’s efforts”. Many executives participated in the event as well as all the people awarded with their families. At the same time, HEDNO sent gifts to 127 children of its employees who were excellent students in different parts of Greece. Information - Discussion on the subject: “Reliable provision of information for the prevention and early diagnosis of breast cancer"
Aesthetic upgrade of the substation located at 24, Lekka str.